You’d be hard pressed finding someone who doesn’t have “see the who doesn’t have “see the northern lights”on their bucket list. I know it featured on mine for years, even though I’d never given much thought to how I would accomplish it. Because all of these people have, at some point, seen a photo of green lights dancing over a pristine winter landscape, they all have a preconception of what they are going to see. For those people, me included (despite all the cautions I received to the contrary), it’s expected that they will walk outside after dark and the sky will simply light up above them. The reality isn’t quite so straightforward. Although to be fair, this was my view one night when I walked outside and looked up. Don’t get me wrong: it’s still one of the most awe-inspiring sights you’ll ever see. It’s just good to know what to expect so you don’t feel disappointed. 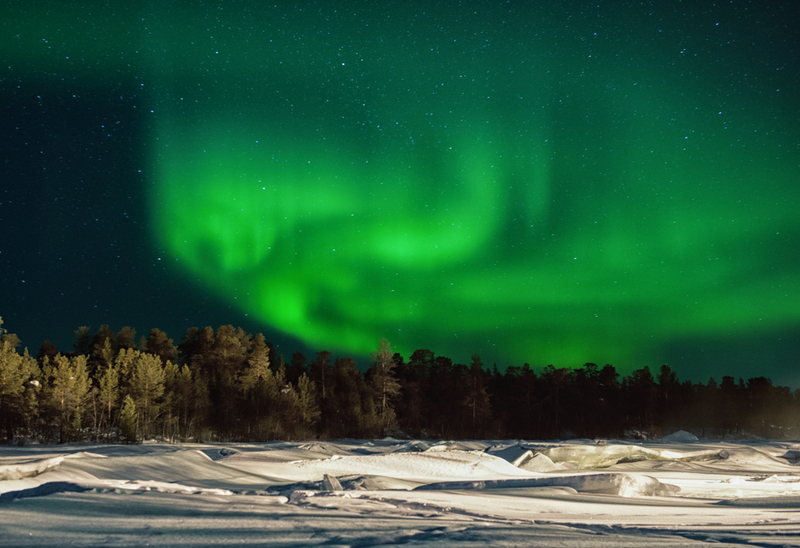 The first thing to know is that the aurora doesn’t usually appear in brilliant colours all at once. Instead, it often gradually makes its presence known as a rainbow-like arc across the northern sky. Rather than being the unmistakable green colour, though, it is can be an off-white colour, almost like a cloud. The northern lights can appear almost colourless, like a cloud (the red is actually light pollution). 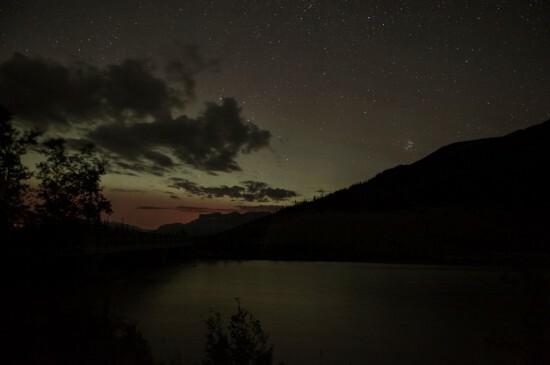 This was taken during a low-activity night at low latitudes (Jasper, Canada). However, it won’t behave like a cloud, which you would expect to continue moving across the sky with a reasonably constant speed. At this point, it’s often possible to see the telltale oscillating movement within the arc itself — which was one of the ways I managed to convince my otherwise incredulous mother that I hadn’t gotten her out of bed at 1am to watch clouds move across the sky. 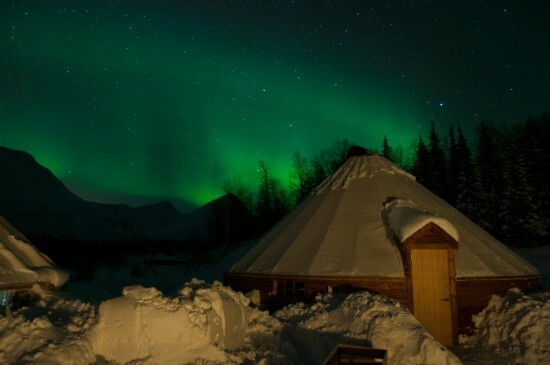 The oscillations of the aurora are best described by traditional Sami drawings of the phenomenon. To me, it almost looked like a slinky being pushed together and then pulled apart on a massive, massive scale. 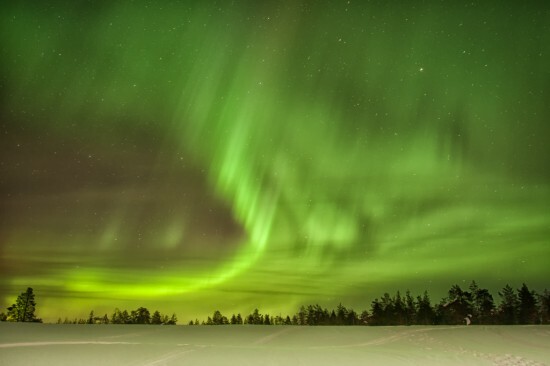 A typical artist impression of the northern lights. This one was seen in the SnowCastle in Kemi, Finland. Excitedly point and ask everyone if that is what you think it is. This is what I did the first time I saw them, but fortunately I had a group of about 10 other people around me that were all doing the same thing. Take a photo with high ISO and a long shutter speed. I usually cranked mine up to ISO3200 with an aperture of 2.8 and a shutter speed of 1s or so. 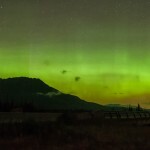 It doesn’t matter if it’s handheld and blurry — what you want to see is whether what you’re watching in the sky is still white (meaning it’s a cloud) or whether it’s started to turn green with the longer exposure. 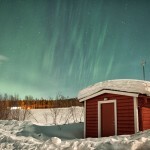 This was the aurora that I excitedly pointing at, saying ‘is that what I think it is? !’ Eventually it turned green enough that it removed all doubt from our minds. 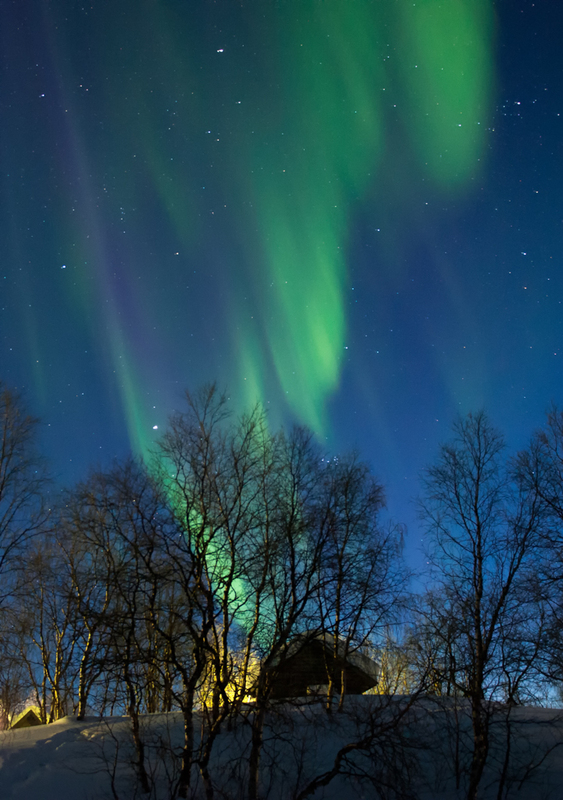 It’s well worth sticking around if the northern lights appear in this form, because they alternate between strong and weak phases, often in a very short period of time. That “white cloud” can very quickly turn into a full-fledged green and pink light show…or it could be the strongest the aurora gets all night. It’s also good to remember that conditions can drastically affect the visibility of the aurora — if it’s full moon or if you’re around a lot of light pollution from city lights, the aurora will appear a lot duller than it actually is. Also, if you are seeing the aurora at a lower altitude — for instance, in the lower 48 US states or in Tasmania — it is likely to be much less obvious in the sky. Not the best photo by any means, but it shows the arching rainbow-like shape that the aurora can take on. All aurora photographers — myself included — are guilty of taking photos that don’t quite reflect reality. Aside from being able to make the sky appear green when the naked eye can only see white, long exposure photos mean a lot more movement is captured in one shot than you would see otherwise. Essentially, this takes several moments in time and combines them into one photo, making an image that is more spectacular because it was more than you ever could have seen at one time. It also creates shapes and formations that you may not be able to spot at the time, especially because there is often so much movement going on in the sky that it’s hard to concentrate on just one section. Can you see the hooded man flying across the sky? I didn’t when I was watching the lights that night. I took this photo in a series as the lights welled up in the sky, turning from the aforementioned arch in the sky into a writhing mass of green. As I stood there in awe of the most spectacular aurora I’d seen so far, I definitely did not have time to pick out any particular shapes in the sky, yet now I can very clearly see what looks like a man with a hood on and his arms out flying across the sky. A giant smiley face in the sky over Kätkävaara. 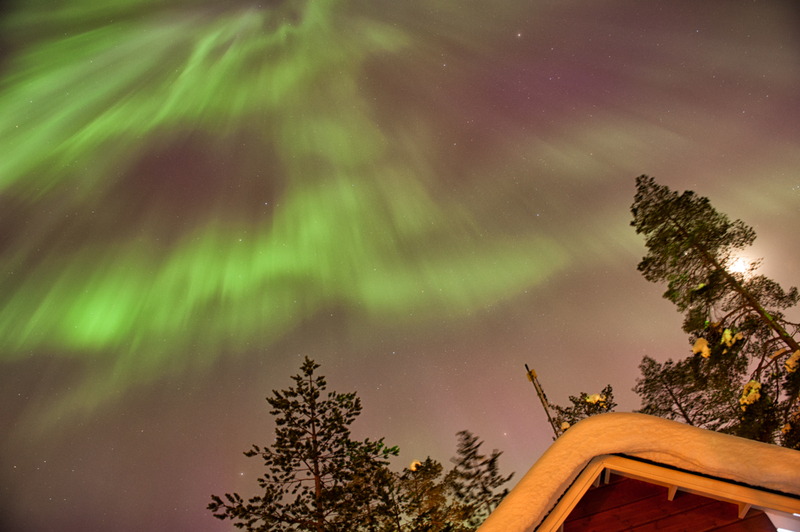 This photo was taken during a solar storm that I witnessed from a hilltop in Kätkävaara, Finland. Again, I didn’t stop and point as I would to a interestingly-shaped cloud, thinking, “wow, doesn’t that look like a smiley face?” On that night, the entire sky, from northern to southern horizon, was alight, and I had no idea which way to look. I probably would have spend most of the night with my mouth hanging open if the temperature hadn’t been hovering around -20ºC. The purple in this aurora was picked up by the camera well before I saw it myself. So is it a bad thing that the lights won’t look like the photos you’ve seen? Not at all — that’s part of the joy of it. You never know what you’re going to see or what shape or colour it might take. It’s just important to know that the images your eye can see are very different to what your camera can capture. Each are spectacular in their own way, and while there may not be as much going on — or as much colour — in the sky as you see in one image, it’s always much, much better because you are there witnessing it for yourself. Did you enjoy this post? 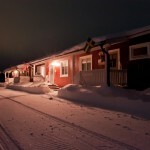 Want to know more about travelling in Lapland? 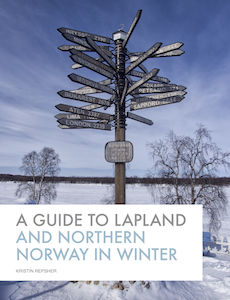 Sign up for my 'Guide to Lapland' newsletter to get exclusive updates and pre-sale information for the upcoming 'Guide to Lapland and Northern Norway in Summer'! Kristin, thanks for this informative post. This is something I would love to experience in person! I hope you get to experience the aurora in person someday Michela! It’s a truly amazing experience (although addictive too, which is difficult when you live as far away from it as Australia)! No worries Edna! I hope this helps you spot the northern lights — although hopefully they will be so strong that you won’t need to figure out whether you’re looking at a cloud or the northern lights *fingers crossed*. This year is supposed to be the solar maximum so the shows should be pretty spectacular! Thanks for your insights. 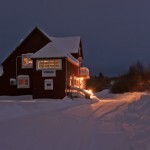 Looking forward to my Tromsø Villmarksenter tour tomorrow. Hi Francis, I hope you have a great time on your tour with the Villmarksenter. The scenery up there is gorgeous, even by night (which is the only way I saw it). Which tour are you doing? So glad you hear you had a great time! I love dogsledding — it was one of my favourite activities in Lapland. Aren’t the dogs just so adorable? Hope you have been able to see the northern lights by now! I’d recommend trying to take a tour that heads inland towards Finland if you’ve been having trouble with clear skies along the coast. Good luck! Thanks, Kristin. I was at a northern Montana fire lookout when, at about 11 p.m., I was peering at the sky and noticed a wide, low arc of light across the horizon toward Canada. I froze in place and felt tears come to my eyes, realizing this might be the Northern Lights. They are on my bucket list but I don’t have an immediate plan to see them; it was a complete surprise. Despite the brilliant green we see in photos, it was still distinctly different, like nothing I’ve ever seen. I thought to myself, “Surely this can’t be …. ” But I am glad to see your post here to know that indeed I had seen them!!! Yes it’s true that the Northern lights require effort. 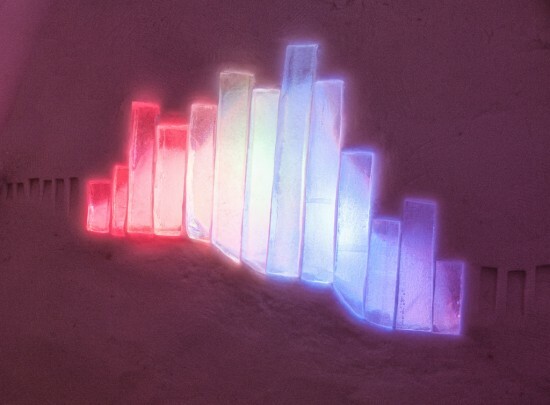 They aren’t just going to appear every clear night and dance in a kaleidoscope of colours until dawn. I have seen them five times. Once purely by chance from South Wales on 8th November 1991, very bright reds and overhead, spectacular, even Patrick Moore mentioned this display in one of his many books. I was on Orkney last year and heard that the night I arrived the lights had made an appearance so the next night I walked above the street lights of Stromness at about ten p.m and looked straight towards the Pole Star. I was treated to a greyish white display for about two hours, Really had to adjust my eyes to the dark and be patient, It was a very slow formation, like someone shining the beams of torches into the air or a SLOOOOW heart monitor. The same happened the next night. I saw them again from Glastonbury in October, very clear and looked like a crazy cloud formation but it was such a clear night there was no way it was a cloud. It looked like a dancer’s skirt or a woman’s knee. I called my friend and she joined me to watch, and we saw the “torch” beams again for a couple of hours, could just pick out faint green and pink colours. The last time was on Samhain, October 31st, Bitterly cold Halloween evening and my friend and I were walking through a cemetery near Newbury, We saw a very distinct single curved line, again greyish in colour which gradually moved lower in the sky until it faded. So yes, head out a few hours after dusk, away from Street lights.. Autumn is good!! Look towards the Great Bear and the Pole star, and look LOW. Then wait and be patient. 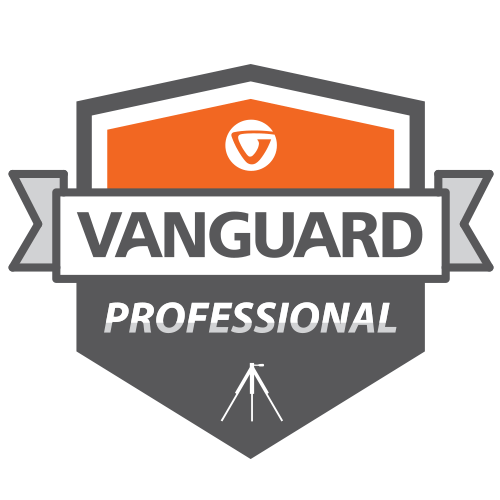 It is not always going to be a multi colured time lapse display, but you will be rewarded for your patience.